Previously General Vernon Walters Had Speculated that Zia Was "The Most Superb and Patriotic Liar I Have Ever Met"
President Reagan meets with Pakistani dictator General Muhammad Zia-ul-Haq at the Oval Office on 7 December 1982. Standing across from Reagan is national security adviser William Clark. During the meeting, Reagan laid out specific parameter for the Pakistani nuclear program: no assembly or test of nuclear devices, no transfer of technology for such devices, no violation of international safeguards, and no unsafeguarded reprocessing (see document 20). Image courtesy of Ronald Reagan Presidential Library, film number C11730-6A. 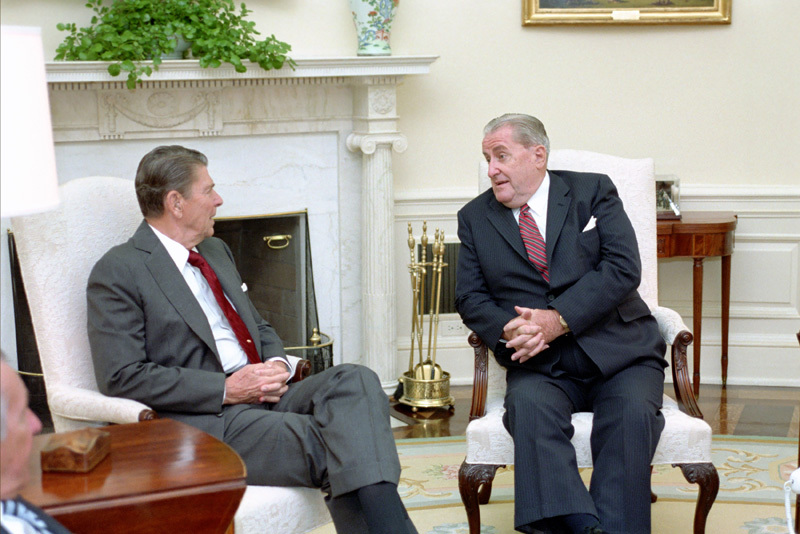 Reagan meets with Ambassador Vernon Walters, 17 April 1986. By then, Walters had undertaken a number of secret missions for the Reagan administration, including visits to Pakistan and to Ethiopia to secure the release of a CIA officer. Image courtesy of Ronald Reagan Presidential Library, film number C30191-16A. Washington, D.C., April 27, 2012 – Tensions between the United States and Pakistan rose through the 1980s over intelligence reports that suggested to U.S. officials that Pakistani leader Zia ul-Haq had repeatedly lied to them about his country's nuclear program, according to recently declassified records published today by the National Security Archive and the Nuclear Proliferation International History Project. Zia's apparent mendacity posed an immediate challenge to U.S. nonproliferation goals, but also threatened the even higher priority of providing aid to Islamabad and to the Mujahedin resistance fighting Soviet forces in Afghanistan. Preventing the spread of nuclear weapons has been a significant objective for U.S.presidents, but there have been instances when diplomatic and other interests have overridden concerns about nuclear proliferation. Israel since the late 1960s is one example and Pakistan during the 1980s is another. Concerned by new intelligence about the Pakistani nuclear program, in July 1982, the Reagan administration sent former CIA deputy director General Vernon Walters to meet secretly with Pakistani dictator General Muhammad Zia-ul-Haq. U.S. intelligence had detected an upswing of clandestine Pakistani efforts to procure nuclear weapons-related technology and unwanted publicity could jeopardize U.S. government economic and military aid to Pakistan, a key partnerin the secret war against Soviet forces in Afghanistan. Confronted with the evidence, Zia acknowledged that the information "must be true," but then denied everything, leading Walters to conclude that either Zia "did not know the facts" or was the "most superb and patriotic liar I have ever met. "�� While Zia restated earlier promises not to develop a nuclear weapon and made pledges to avoid specific nuclear "firebreaks," officials from Secretary of State George Shultz on down would conclude time and time again, that Zia was breaking his word. In 1986, Arms Control and Disarmament Agency (ACDA) director Kenneth Adelman wrote in a memorandum to the White House that Zia "has lied to us again," and warned that failure to act would lead the General to conclude that he can "lie to us with impunity." 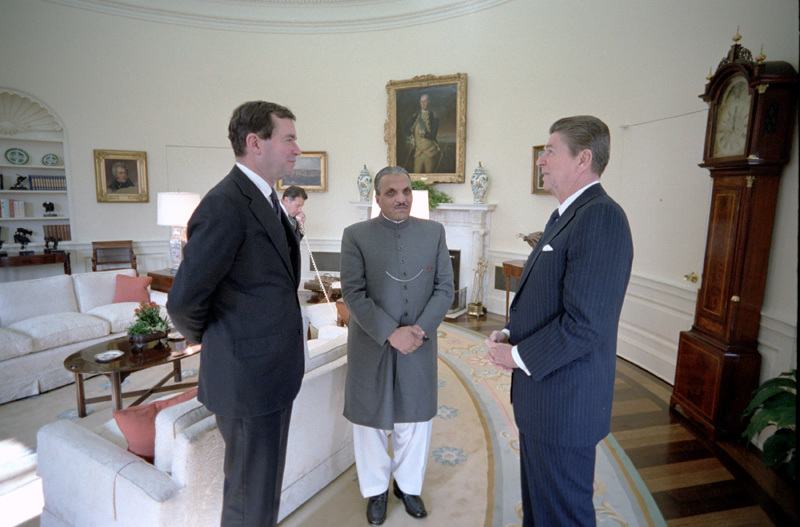 While the Reagan administration was concerned about nuclear proliferation, it gave a greater priority to securing aid to Pakistan so it could support the Afghan anti-Soviet insurgency.� The White House and the State Department leadership hoped that building a strong bilateral relationship would dissuade Pakistan from building nuclear weapons. Top levels of the U.S. government let relations with a friendly government supersede nonproliferation goals as long as there was no public controversy that could "embarrass" the President the documents show.� Indeed, Reagan administration officials feared that if the Pakistanis had told them the "truth" about the purpose and scope of their nuclear activities, it would have made it impossible for the administration to certify to Congress that Pakistan was not developing nuclear weapons.� On that certification rode the continued flow of aid to assist the Afghanistan resistance. For the sake of that aid, senior Reagan administration officials gave Pakistan much slack by obscuring its nuclear activities, but that they wrote about lying and "breaking ... assurances" suggests that lack of trust and confidence was an important element in the U.S.-Pakistan relationship, as it is today. By the early summer of 1981, State Department intelligence estimated that the Pakistanis were� "probably capable of producing a workable device at this time," although the Kahuta enrichment plant was unlikely to produce enough fissile material for a test until 1983. Pakistan was slated to acquire F-16 fighter-bombers from the U.S.� That prospective sale troubled Indian leaders because a nuclear Pakistan with advanced fighter bombers would be a more formidable adversary. During the spring of 1982 U.S. diplomats and intelligence collectors found that Pakistani agents were trying to acquire "fabricated shapes" (metal hemispheres for producing nuclear explosive devices) and other sensitive technology for a nuclear program. Suggesting that Pakistan was starting to cross the line by building a nuclear weapon, these discoveries contributed to the decision to send former CIA deputy director Vernon Walters to meet secretly with General Zia in July and October 1982. During Walters' October 1982 visit, Zia told him of his meeting with Saudi Arabia's King Fahd who had told him that agents from an unspecified country had attempted to sell him a nuclear device for $250 million. Zia advised Fahd not to "touch the offer with a barge pole." A controversial element in the F-16 sale was whether the U.S. would comply with Pakistani requests that it include the same radar system as the most advanced U.S. model. While top CIA officials warned that the Pakistanis were likely to share the technology with China, Secretary of State George Shultz and other officials believed, ironically, that denying Pakistani requests would make that country less responsive to U.S. nonproliferation goals. With Pakistan's efforts to acquire sensitive technology continuing,� in December 1982 Secretary of State Shultz warned President Reagan of the "overwhelming evidence that Zia has been breaking his assurances. "� He also expressed concern that Pakistan would make sensitive nuclear technology available to "unstable Arab countries." In June 1986 ACDA director Kenneth Adelman wrote that Zia has "lied to us again" about violations of agreements not to produce highly-enriched uranium above a five-percent level.� If Washington did not apply real pressure it would reinforce Zia's belief "that he can lie to us with impunity." In the spring of 1987, senior State Department officials wrote that Pakistani nuclear development activities were proceeding apace and that General Zia was approaching a "threshold which he cannot cross without blatantly violating his pledge not to embarrass the President." Until 1990, after the Soviets had left Afghanistan, Washington never allowed events to reach a point where public controversy over Pakistani nuclear weapons activities could force a decision that to cut off aid and threaten Pakistan's role as a go�between to the Afghan resistance. �The tough sanctions that have been used against countries like Iran and North Korea were never given serious consideration because the Reagan administration believed that embracing close associates like Pakistan in a "broader bilateral relationship" could discourage them from testing a nuclear device. �U.S. policymakers unsuccessfully tried to jawbone their Pakistani counterparts from enriching uranium and building a nuclear weapon. The other side of U.S. policy was the organized multilateral effort, begun during the Carter administration, to prevent sensitive technology from reaching Pakistan. This largely consisted of efforts to persuade other nuclear suppliers to bar exports of dual-use technology. While international export controls could not stop the Pakistani program, U.S. officials believed that they could "delay" and even "set [it] back". �Those activities were at a high tempo during the early 1980s but whether they continued at the same pace during the rest of the decade is not clear. More declassifications may shed light on that. This is the third in a series of Electronic Briefing Books on U.S. policy toward the Pakistani nuclear program.� The first was on the Carter administration's policy; the second was on the efforts to work with allies to prevent the export of sensitive technology to Pakistan. 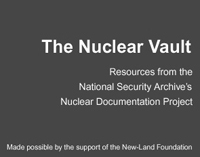 The National Security Archive has filed numerous declassification requests to U.S. government agencies on important developments during the 1970s, 80s, and early 1990s, and as significant material becomes declassified the Archive will update this series of EBBs. Document 1:"Reached a Dead End"
By the spring of 1979, the Carter administration decided that it had "reached a dead end" in its efforts to stop the spread of nuclear technology to South Asia and that a "new strategy" was necessary to check the spread of nuclear weapons in the region. �Given close security ties with Pakistan and concerns about that country's stability, the State Department was not going to take a hard-line approach, such as embargoes. to force a nuclear roll-back. Thus, Washington would maintain "vigilance" to ensure that sensitive supplies did not reach Pakistan, but the administration no longer saw it possible to reverse Pakistan's efforts to construct uranium enrichment facilities.� More serious dangers were a South Asian nuclear arms race and the threat to U.S. nonproliferation policy which "will collapse under the weight of two additional nuclear-weapons states. "�� By playing the role of an "honest broker," and offering appropriate inducements, Washington would make a "sincere attempt to convince South Asians that nuclear weapons are not a viable option." Three interrelated actions were necessary. Pakistan would have to be persuaded not to stage a "peaceful nuclear explosion," along the line of India's 1974 test, because that would push India to develop a nuclear arsenal and even consider preemptive action.� The U.S. would have to seek assurances from Prime Minister Desai that India would not produce nuclear weapons. Finally, Washington would need China's support, e.g. security assurances to India.� To make these arrangements work, Washington would have sell nuclear fuel to India and lift the Symington amendment sanctions against Pakistan that the enrichment program had triggered.�� Policy success was by no means assured--China might not cooperate--and other uncertainties could complicate matters, for example, if Pakistan helped other Muslim states develop an "Islamic bomb." Document 2: "Two-Step Carrot-Stick Approach"
Document 3: "Set the Nuclear Issue Aside"
The Soviet invasion of Afghanistan in December 1979 had an immediate impact on U.S. policy toward Pakistan as indicated by Secretary of Defense Brown's talks with top Chinese officials.� In light of the high priority of funneling aid through Islamabad to the anti-Soviet resistance and concern that Moscow might put Islamabad under pressure, interest in improved relations with Pakistan further lowered the nuclear issue's priority, although efforts to block sensitive exports continued.� As Brown explained to Deng, "we will set [the nuclear issue] aside for the time being and concentrated on strengthening Pakistan against possible Soviet action." �In other words, Cold War objectives had priority over nonproliferation concerns. �While Deng claimed that Beijing opposed Pakistan's nuclear program, China and Pakistan had already developed a special nuclear relationship and ambivalence was evidence in Deng's advice that the United States "not mention" the nuclear issue in talks with Pakistan. Document 4: "Pakistan Will Not Give up This Program"
According to INR analysts, the Pakistani leadership wanted to improve relations with Washington and certainly get a bigger aid package than the "peanuts" offered by the Carter administration. Nevertheless, INR recommended caution about getting too close to General Zia; he would be gone someday and "too close a US tie ... might harm future relations. "� Moreover, better relations would not make the nuclear problem go away: "Pakistan will not give up this program. "� There was some chance that Pakistanis could be persuaded not to test a device but this "would be difficult to accomplish. "� The Indians might react badly if Washington gets too close to Pakistan: "they might well retaliate by moving closer to the Soviets." Document 5: A "Broader Bilateral Relationship"
A new presidential administration wanted to put its own stamp on nonproliferation policy and the Department of State helped begin the process with a draft paper on the "security dimensions of nonproliferation." Convinced that further spread of nuclear capabilities could have an adverse impact on U.S. security, the report emphasized the importance of perceptions of insecurity as a motive leading states to opt for a nuclear explosive program. While denial of sensitive technology and equipment remained "fundamental," State Department officials believed that a "broader bilateral relationship" based on the integration of political incentives and security assistance could persuade friendly threshold states that they did not need nuclear weapons. By contrast, "more negative methods of dissuasion" would apply to countries which had poor relations with Washington. The State Department's review of threshold states, from Argentina and Brazil to Libya and Iraq, include a discussion of Pakistan, where the "broad bilateral relationship" approach was taken into account.� �The U.S. objective should be a "closer security relationship which builds confidence in us and makes the Paks feel more secure. "� Such a relationship would be "more likely to provide Pakistan with incentives to forego, or at least delay, a nuclear test than any alternative approach." �Following the Carter administration, the Reagan team had minimal goals: preventing a Pakistani nuclear test, not dismantling the enrichment program, had become the key objective. �Nevertheless, State's politico-military analysts argued that Washington should not give the impression that was acquiescing in Pakistan nuclear activity: �it was necessary to "lay down a marker" by making Pakistani officials understand the "political costs" of continuing a weapons program. Document 6: More "Carrots and Sticks"
Document 7: "Probably Capable of Producing a Workable Device at this time"
This report provides an overview of the state of the Indian and the Pakistani nuclear programs, reviewing motivations, the technical situation, possible decisions to test, and the implications of a Pakistani test. According to INR, the Pakistanis are "probably capable of producing a workable device at this time," but the Kahuta plant was unlikely to produce enough fissile material for a test until 1983. While the Indians had stated publicly that they were preparing their test site that declaration may have been for political effect because they may have wanted the Pakistanis make the "first move. "� If Zia decided to do so, he would have to decide whether to risk worsening relations with Washington and a heightened regional nuclear arms race. Indira Gandhi would likely order retaliatory nuclear tests and quiet work on a weapons program. But if Pakistan went further and began an active nuclear weapons program, India was not likely to take risky preventive action because of the difficulty of taking out "Pakistan's well-defended nuclear facilities" and the risk of "antagonizing China. "� INR analysts opined that a nuclear South Asia would not be a stable region: "it is difficult to be optimistic that a stable, long-term mutual deterrence relationship would be established." An International Atomic Energy Agency finding that Pakistan may have diverted plutonium from the Karachi nuclear power plant was raising questions about the adequacy of safeguards, but intelligence reports suggested that the Pakistanis "were not overly concerned" about the accusations. More serious were the implications of U.S.-Pakistani discussions of the sale of advanced F-16 fighter-bombers as part of a larger U.S. aid package to secure Pakistan's collaboration in the covert war against Soviet forces in Afghanistan. Indian Prime Minister Indira Gandhi worried that Pakistan's nuclear program and its slated acquisition of F-16s posed a "great security threat" that raised the risk of war. The heightened Indian concerns about Pakistan discussed in the August "Warning Report" raised enough hackles in the Reagan administration for the CIA to produce a Special National Intelligence Estimate on the possibility of Indian preventive action against Pakistan's nuclear program.� While the estimators could not be sure, they believed that Prime Minister Gandhi would take a "wait-and-see" approach as to whether Pakistan 1) was going to test a device and 2) keep producing fissile material for weapons.�� India would have to decide whether to stage an "answering test" (for which preparatory work had already been undertaken), but also whether to take preventive action before Pakistan had a weapons stockpile. Israel's use of F-16s to destroy Iraq's Osirak nuclear reactor in June 1981 and Washington's announcement on 14 September of the F-16 sale to Pakistan made Indian defense officials wonder whether preventive action against nuclear facilities was necessary before Islamabad had the fighter-bombers (for which nuclear-capable versions existed).� If India took such action it would have to face the prospect of a "severe" international reaction as well as the possibility that China might intervene on Pakistan's behalf.� One alternative for India was to develop a nuclear stockpile superior to Pakistan's.�� That would take a high-level decision to produce nuclear weapons, while financial, technological, and other considerations might encourage Gandhi to move slowly.� Nevertheless, the possibility that India (or even Israel) would take preventive action against the Pakistani nuclear program would be a continuing concern. Document 10: "In All Probability We Would Choose to Cut off Assistance"
While concerned about what India might do, the Reagan administration focused on working with Pakistan to weaken the Soviet position in Afghanistan. �Facilitating that involved a multi-billion military and economic aid package to Pakistan which included a five year waiver of the Symington amendment to eliminate automatic triggers that would cut aid if Washington detected evidence of nuclear weapons work.� Nevertheless, Congress imposed some conditions, namely that aid would stop if Pakistan tested a nuclear weapon.� To confirm that the administration was on board, Senator Mark Hatfield, who had long been concerned about nuclear proliferation, asked Secretary of State Alexander Haig how the U.S. government would react to a Pakistani nuclear test.� Haig replied that "in all probability", Washington would cut aid. Haig might have thought that there would be no problem because General Zia had assured Under Secretary of State James Buckley that he would not develop or test a nuclear weapon (See document 11A for that assurance).� On human rights, another of Hatfield's concerns, the Reagan administration was departing from the human rights emphasis of its predecessor.� Haig would make no commitments because of Pakistan's "limited tradition of representative government." A planned update of a Special National Intelligence Estimate concluded that the Pakistani nuclear program was keeping its momentum and that new evidence, apparently acquired by British intelligence, suggested a "significant" Chinese role, at least in providing assistance on weapons design. CIA was apparently adjusting its earlier estimate---late 1982/1983-84--for the availability of fissile material for weapons.� The implication was that a Pakistani test was not imminent, thus reducing pressure on India. The Reagan administration gave Pakistan some slack, but it continued the campaign of demarches, begun under Jimmy Carter, to try to prevent the export of sensitive nuclear technology to Pakistan, among others. (See EBB "Demarches and Non-Papers") ��As before, Pakistan was a special target of concern, but these summaries of State Department telegrams, some in the sensitive intelligence-related "Roger" channel, show that Washington was also trying to prevent sales of nuclear-related technology to a host of countries: Argentina, Brazil, China, India, Iraq, Israel, Korea, Libya, Romania, South Africa, and Syria.� For example, cable traffic on Syria showed concern about Damascus's interest in acquiring a research reactor, while messages on Libya show U.S. government efforts to discourage Belgian sale of a plant to produce uranium tetraflouride (the precursor to uranium hexaflouride, used for uranium enrichment). Documents 13A-B: "The Most Superb and Patriotic Liar"
In what Walters saw as a diversion from the main discussion, the conversion turned to the problem of the IAEA inspection of the Karachi Nuclear Power Plant and recommendations on safeguards to prevent diversion of spent fuel.� Zia repeated his earlier assurances on nuclear weapons and insisted that Pakistan would not "embarrass" the U.S. government.� Walters reported that Zia "took the matter somewhat better than I had expected." The conversation the next day showed that Zia was a master of double-talk. Verbally, he admitted that U.S. intelligence was on to something: "The president must be right. Your information must be right.�� I accept its authenticity. "� But he would not put that in writing and in a formal response to Reagan's letter, Zia argued that the U.S. information was a "total fabrication. "� This, Walter argued, was a matter of keeping "face": what Zia was saying was "it did not happen but you can be sure it won't happen again. "� "I think he has the message," Walter concluded, although he did not explain whether he believed that there would be any changes in Pakistani policy. Documents 14A-B: "Word of Honor"
What Zia said to Walters was irrelevant because U.S. intelligence detected continuing efforts to procure sensitive technology and materials (see next document).� Thus, Walters returned to Islamabad for another demarche in October, to warn Zia that U.S. aid was in "grave jeopardy." (see document 16 below). �Walter showed drawings of Chinese-influenced nuclear weapons designs that U.S. intelligence had obtained, but �Zia denied that there was anything untoward:� Pakistan's reprocessing and enrichment programs were entirely peaceful and there was "nothing" in the nuclear weapons field.� Pakistan would do nothing that would jeopardize its aid and other relationships with Washington.� Any information on clandestine nuclear activities, he suggested, had been concocted by Pakistan's "enemies." As for the items that Pakistan was allegedly attempting to procure, such as "spheres", Zia argued, there was nothing that could not be produced internally.�� Walter said he would review the U.S. evidence, but observed that intelligence advisers had assured him that there was "no possibility of fabrication or disinformation." Zia concluded the meeting with a story based on conversations with Saudi Arabia's King Fahd. The latter had told him that agents from an unspecified country had attempted to sell a nuclear device to Saudi Arabia for $250 million. He had advised Fahd not to "touch the offer with a �barge pole.'" Document 15A-B: "A Serious Blow to U.S. Worldwide Nonproliferation Efforts"
Document 16: "Overwhelming Evidence that Zia Has Been Breaking His Assurances"
George Shultz probably saw the ALR-69 issue as a minor problem compared to the "overwhelming evidence that Zia has been breaking his assurances" on Pakistan's nuclear weapons program,� Shultz may have accepted the interpretation that Zia was a patriotic liar" but this raised a tough diplomatic problem because the General would soon be in Washington to meet President Reagan.� Citing an interagency report on issues and options, Shultz saw high risks because good relations with Pakistan, especially while the war in Afghanistan was in progress, were a major strategic interest. Yet, if Pakistan continued its nuclear weapons work, Congress could cut off aid.� Moreover, a South Asian nuclear arms race could destabilize the region, not to mention the dangers of Indian and/or Israeli preemptive action against Pakistan, and the possibility that the latter could transfer nuclear technology to "unstable Arab countries." Document 17: "Punish an Indian Attack So Severely that it will be Deterred to Begin With"
On the problem of Pakistani command-and-control over nuclear weapons, the summary of Cohen's report observed that "Pakistan's military has done self-destructive things in the past, and one cannot assume that it will not do them in the future." Yet with greater professionalism in the Army, it was not "likely to make [decisions on nuclear weapons] any more irresponsibility than other states confronted with the same perplexing set of security constraints. "� Cohen did not believe that Washington could do much to reverse nuclearization in South Asia, but U.S. influence could help ensure that proliferation did not lead to greater instability, for example, by limiting the buildup of stockpiles and supporting regional "mutual balanced force reductions" arrangements. Document 18: "Supplying Conventional Weapons ... Can be a Positive Force Against Proliferation"
This interesting review of the South Asian nuclear problem starts by exploring the India-Pakistan nuclear dynamic. If Pakistan tested a weapon, India might resist following through on a weapons option, but might begin a series of tests. Both countries could covertly begin a weapons program. Despite speculation about an Indian preemptive strike against Pakistani nuclear installations, such an occurrence was unlikely because of the serious risks for India, not least the spread of "deadly radiation poisoning." While New Delhi had resisted internal pressures for weaponization, changes in the security environment could weaken resistance, for example, if relations with Beijing worsened or if Chinese-Soviet relations improved (which would make the Indians more worried about Moscow's reliability). The INR analyst believed that Washington had the most "leverage" with Pakistan because of the latter's dependence on U.S. supplies of conventional weapons. "Supplying conventional weapons to Pakistan can be a positive force against proliferation" because they "can give Pakistan sufficient confidence in its own security that it would find the nuclear option less attractive and unnecessary. "� This may have been the basis of State Department thinking that not meeting Pakistani desiderata on such issues as the F-16 would be a blow to nuclear non-proliferation policy. The challenge, however, was to not over-arm Pakistan because that could threaten Indian security and "increase the danger of nuclear proliferation in South Asia." Document 19: Pakistan Has "Produced an Atomic Weapon"
Only months after Congress enacted the Pressler amendment, an intelligence source claimed that Pakistan with Chinese assistance had "produced an atomic weapon in early October." DIA had received similar reports and was trying to confirm this one.� That U.S. intelligence believed that Pakistan was producing enough HEU for at least one device becomes evident in the next document. Document 20: "He Lied to Us Again"
More declassification actions will elucidate what the United States discovered during 1982-1986 about the Pakistani nuclear program, the renewed efforts to prevent procurement of sensitive technology, and high-level pressures to discourage secret nuclear work, but this memorandum by ACDA director Adelman gives perspective on some developments after the Reagan-Zia meeting in late 1982.�� The points that President Reagan made to Zia in December 1982 were re-stated in a May 1984 "non-paper" and then refined the following September when Reagan informed Zia that enriching uranium above 5 percent� would be just as problematic as unsafeguarded plutonium reprocessing. But Reagan never put serious pressure on Zia to comply. �According to Adelman, the Pakistanis had been producing enriched uranium above the five percent level and, after� overcoming an important "hurdle," were enriching uranium at levels high enough (presumably close to 90 percent) to produce "one or more nuclear devices. "� Adelman insisted that Zia was lying to Washington about this and that these activities jeopardized U.S. aid to Pakistan. The problem was that Washington had only "jawboned" General Zia instead of applying real pressure, thus undermining Reagan's credibility and reinforcing "Zia's belief that he can lie to us with impunity. "� This raised serious problems for Congressional approval of aid, not only for certifying that Pakistan did not "possess" an explosive device, but also for renewing the 1982 Foreign Assistance Act that had exempted Pakistan from more rigorous nonproliferation standards. Adelman recommended the precise application of pressure�to give Zia the "stark choice" of continued aid or the enrichment program.� The possibility that Zia might resist could make it necessary to "tough it out" with Congress to assure the continuity of �aid.� But Adelman thought it possible that pressure would work and that Zia would conclude that "payoff" of U.S. aid and military sales was too high to forego. Document 21: "Annual certification ... very problematic"
With Prime Minister Junejo about to visit Washington ACDA director had suggested that the U.S. tell him that pending a policy review on the Pakistani nuclear program "all actions involving military sales" have been halted .� But this harder-line view apparently found no takers because the State Department briefing book for the Junejo visit only suggested tacit threats, not the "stark choice" that Adelman had recommended, that certification was "very problematic" without "positive Pak actions to help convince the Congress" which meant "quiet Pak actions to restrain [the enrichment] program." On the status of the Pakistani program, the briefing book included an intelligence finding [page 39 of pdf] that if the Kahuta plant operated at capacity it could produce enough m for "several nuclear devices per year. "�� Nevertheless, it was "our assessment ... that Pakistan does not possess a device. "� The highest levels of the Department were taking the position that Pakistan was in compliance with the Pressler amendment. Document 22: "Absolute Criticality ... of Restraint"
Document 23: "He Has Approached a Threshold"
With the U.S. considering sales of airborne early warning aircraft (AEW) to Pakistan, Richard Kennedy, the ambassador-at-large for nonproliferation matters, had suggested that Washington directly link the sales to "Pakistani action on nonproliferation," but other officials opposed such linkage. Perhaps Murphy raised the issue to see if Shultz had any interest in pursuing it. What action Shultz may have taken on Murphy's proposal remains to be learned, but any pressure exerted was likely to have been weak. Later in 1987, Reagan certified that Pakistan did not possess a nuclear advice; the aid kept flowing. Dennis Kux,The United States and Pakistan, 1947-2000: Disenchanted Allies (Washington, D.C.: Woodrow Wilson Center Press; Baltimore : Johns Hopkins University Press, 2001), 276-277;� Adrian Levy and Catherine Scott-Clark, Deception: Pakistan, the United States, and the Secret Trade in Nuclear Weapons (New York: Walker & Co.: 2007), 116; David Armstrong and Joseph Trento, America and the Islamic Bomb: The Deadly Compromise (Hanover NH: Steerforth Press, 2007), 122-137. Armstrong and Trento, America and the Islamic Bomb, 142-153. Kux, The United States and Pakistan, 282-286; Armstrong and Trento, America and the Islamic Bomb, 142-154, and Levy and Scott-Clark, Deception, 156-163. For details on the Shahi-Vance-Smith talks, see Kux, The United States and Pakistan. 240-241. For Smith's report on his talks, see https://nsarchive2.gwu.edu/nukevault/ebb333/index.htm, document 45. See Armstrong and Trento, America and the Islamic Bomb, 95. For detection of Pakistan's test site, see Jeffrey Richelson, Spying on the Bomb: American Nuclear Intelligence from Nazi Germany to Iran and North Korea (New York: W.W. Norton, 2006), 341. David Albright, Peddling Peril: How the Secret Nuclear Trade Arms America's Enemies (New York: Free Press, 2010), 50. For the Pakistani purchasing networks, see BrunoTertrais, "Not a 'Wal-Mart', but an 'Imports-Exports Enterprise': Understanding the Nature of the A.Q. Khan Network,"Strategic Insights (August 2007) http://www.nps.edu/Academics/centers/ccc/publications/OnlineJournal/2007/Aug/tertraisAug07.pdf . See also Albright, Peddling Peril, 48. T. V. Paul, "influence through Arms Transfers:� Lessons from the US-Pakistani Relationship," Asian Survey 32 (Dec. 1992), 1086. Shultz does not mention his 1982 meeting with Zia in his memoir, Turmoil and Triumph: My Years As Secretary of State (New York: Charles Scribner's Sons, 1993), although at 493-494, he covers a 1984 discussion after Indira Gandhi's funeral. Zia said that Pakistan was "nowhere near" building a nuclear weapon and that "We have no intention of making such a weapon." Kux, The United States and Pakistan, 282-285.